These little dresses are made in a variety of ways. This one is a Cute Little ADORABLE Black Dress! 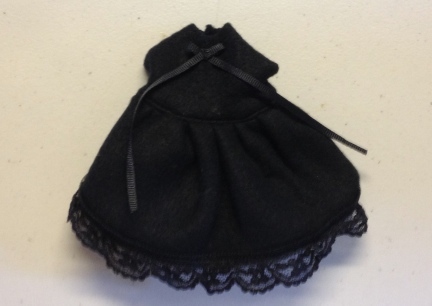 It is Black with Black Lace and an Itty Bitty Black Bow. The waist measurement on this Dress is up to approx 7 1/2", it does have a bit of stretch in it, and the outfit is approx 6 1/2" from neck to tail. These items are new and have never been worn by or tried on by any rattie. The photo is of our rattie (now gone) Nenevah. 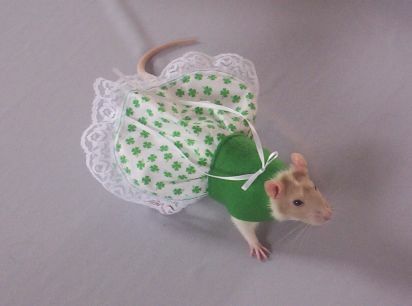 Nineveh is wearing her own little dress to show you what a rattie can look like wearing our creations. All of the money you spend with us goes to care for our animals here in NW SD, many are what people call "rescues", we just call them "ours". <smiles> We appreciate your business. Our outfits are designed and handcrafted in our non smoking SD USA home. The items are non returnable and not refundable. If there should be a craftsmanship error I will replace it with as close to the same fabrics as I possibly can. We only except Paypal Payments. HOWEVER! Paypal is more than happy to except your Credit Card and or Personal Checks. This smaller item has a smaller shipping charge of $2.37 to the USA when shipped with similar items. Your shopping cart will show your shipping costs and total based on the items in it.